All Tours now include bonus Chocolate Icewine Shooters, WOOHOO! All tour & tasting fees, cheese and chocolate platter, Chocolate Icewine Shooters! Amazing junk food pairings, private structured tasting and private production tour. A wine savvy industry professional tour guide, upgraded wines, including top Icewines, world's best award winning wines and round trip transportation. Come out and have the Best Bachelorette Day ever, we know you will love it! NEW FOR 2019! — Your bride has found her Prince Charming, now she can sip her wine out of her very own Glass Slipper! super destination savings SPRING booking spectacular! sip and savour bachelorette tour itinerary - so you can plan your day! 1:00 pm. - Niagara Falls. - 1:30 pm. Niagara on the Lake. Guest Pick up from your Accommodation2:00 pm. - First Winery, Structured Tasting, Cheese and Chocolate Platter, Chocolate Icewine Shooters.3:15 pm. - Second Winery, Private Production Tour, Planned Picture Event, Private Tasting and Junk Food Pairings.4:30 pm. - Chocolate Factory, Private Party, Full Glasses of Wine, Chocolate Making, Stories and Prizes, woo hoo! !5:30 pm - Niagara on the Lake. - 6:00 pm. Niagara Falls. Guest Return to your Accommodation. Are you getting married? Is one of your friends? Are you the Maid of Honour looking to book the best wine tour in the history of the world for your Bride to be? Presumptuous... Yes. We have years of experience providing the best day out for you and your friends. You have come to the right place, our tours are legendary! Most groups don't want to know the ideal soil conditions for growing grapes, or how to prune them for maximum benefit. You do however want to have some drinks, some laughs, some socializing and a lot of pictures. 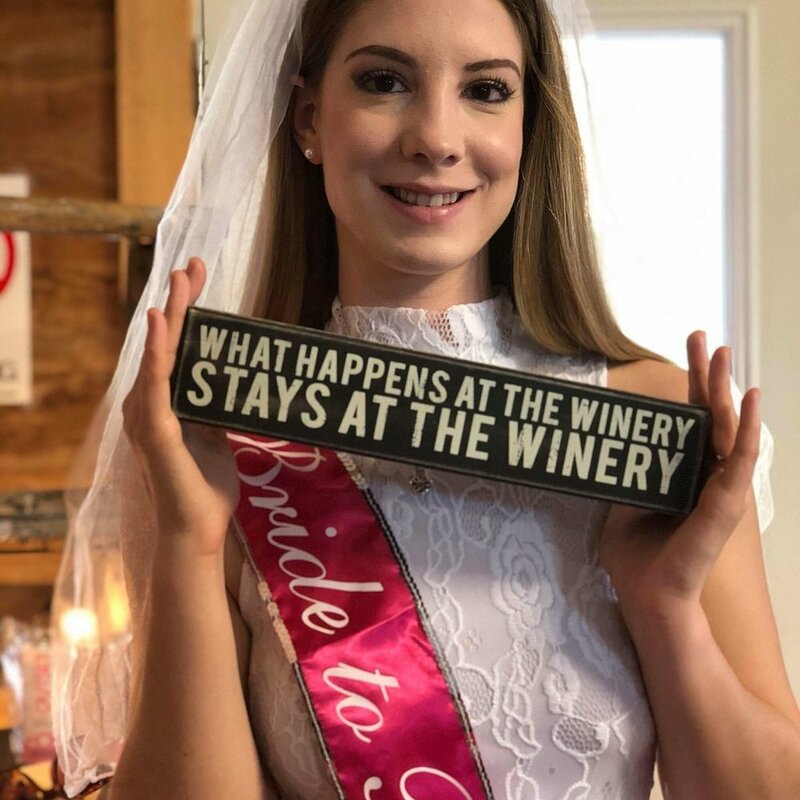 Our small group Bachelorette Sip, Savour and Chocolate Factory Wine Tour provides a social and light hearted way, to spend your time in the Niagara Wine Tours Region. Our Niagara wine tours visit smaller, intimate wineries and includes a five cheese platter, with chocolate, yum, all expertly paired with the wines, as well as the services of an experienced and entertaining tour guide. Did we mention the Chocolate Factory? We start our Afternoon Wine Tours earlier than most companies, we will pick you up at locations in Niagara Falls around 1:00 pm and Niagara on the Lake around 1:30 pm. This will give you enough time to wake up, enjoy lunch and be ready for your exciting day out. We get to the wineries mid-afternoon and avoid the crowds. We get quieter better service by starting earlier, including private tours of the production facilities and a visit to the vineyard to say hi to the grapes. The tour will usually run until 5:30 pm or so, but we have been known to come back later, when the group is having so much fun!! We will have lots of time for pictures, of course you want everyone to share in your special day, our guides are only too happy to take pictures at the wineries, in the vineyard, in front of the barrels, riding the barrels, we try not to judge! For our Bachelorettes, we will make sure you have lots of photos to remember your special Niagara wine tours day! In fact we visit some very special locations, just to make sure you get some very special pictures to remember your truly remarkable day out! We will do a structured tasting at the first winery, no you don't have to worry, it is easy and fun. We will explain finally why people really do swish and swirl and examine wine before having a sip. We will pair five wines, including Ice Wine, probably the best one in Canada, and possibly the world. Known as the 'Gold medal winner dessert wine of the year', it really doesn't get much better! All the wines we taste are specially selected. The wineries showcase their better wines for Niagara Wine Tour Guides, so you will taste the very best the region has to offer. We do this as we want to be known as the best tour there is, and to be the best, you visit the best wineries and you taste the best wine. You will also have a Bonus Chocolate Icewine Shooter, just because, who doesn't want a bonus Chocolate Icewine Shooter? We will do a private tour of an award wining facility, where you will learn how wine is made, how it is stored, and bottled. You will be able to ask questions of the Niagara Wine Tours Guide, and they will do their best to answer. We try to mix the tour up so you get a nice blend of touring and tasting. We don't want to stand around at a tasting bar at each location, we want to walk around and see why each of the wineries are different, and how they make the wines that they do. That is how we are different than other tour companies, we actually tour the facilities. The last stop will take us to Chocolate FX, a chocolate factory. Now that you have had a bunch of food and wine, time for chocolate! You will have a private session with a chocolate maker, where you will be asked to sculpt certain body parts from memory, you will be judged, the winner will get an extra special gift! Oh there will be photos here as well, and they are fun. At the end of the tour, you will need to relax, remember, you have been going for a long time. You need a chance to relax and especially to eat. After trying so many wines, and chocolate, eating is a good thing. You will have the evening left to enjoy and have some food. You will be hungry, tasting wines is hard work, some think it's easy to go around all day tasting, but you have to be in good shape, phew! You will be glad you booked your very special Bachelorette tour with us, I guarantee it! I hope you have enjoyed reading about our very special small group Bachelorette Sip, Savour and Chocolate Factory Wine Tour. We love what we do here, it shows on the faces of those who take the tour. If you have any questions, please visit our FAQ's page to see if we can answer them all, or just give us a call. We look forward to seeing you on the tour in the very near future! You will have to contact us to book this tour, to make sure of the dates and to get all the details to make your day perfect! Visit Niagara Wine Country with Niagara’s top rated wine tour guides. 5 Star Reviewed on Trip Advisor and top rated in wine tours and more!